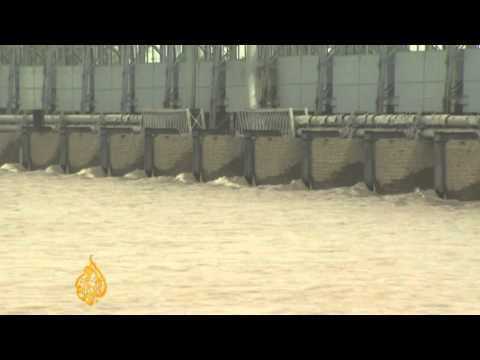 The raging, swollen Indus River abruptly breached an embankment in the Thatta district in Sindh, Pakistan, on Wednesday evening, unexpectedly sending flood waters toward the town of Thatta and several others in the district. Panicked residents tried to flee in the thousands. As a result, authorities are calling on a further 500,000 Pakistanis to evacuate. Some 17 million Pakistanis have already been affected by the floods. Some parts of the country look like an inland sea. (About a fifth of the country is underwater and a third of its districts are affected by the catastrophe). Lord Julian Hunt argues that global warming is responsible for the floods and that such extreme weather events in India and Pakistan are becoming more common as time goes on. Hunt is former director-general of the Meteorological Office in London. The US government contribution to flood relief is now approaching $200 million; a decision has been taken to divert $50 mn. from the Kerry-Lugar act, which had already authorized development aid, to the relief effort. As if another several hundred thousand people hitting the road with inundations breathing down on them were not bad enough, now the Pakistani Taliban are threatening to attack foreign aid workers trying to help the victims. PBS News Hour has more.